he Legend of Zelda: Ocarina of Time is an undeniable classic, both a design touchstone and one of the best-loved titles in the video games medium. With this being the era of reissues and remakes, it was only a matter of time (no pun intended) until Nintendo revived this legend on one of its current systems. And thus we have The Legend of Zelda: Ocarina of Time 3D. It's being heralded by many as the first killer app for the cutting-edge 3DS portable, which is ironic given that it's an enhanced port of a thirteen-year-old Nintendo 64 title. While the game has aged remarkably well, it's not the tour de force that 3DS owners might have hoped for. As you'd expect, the game has undergone a huge graphical overhaul boasting increased polygon counts, high-resolution textures and a silky smooth frame rate. Animations have also been improved and added in places while some environments have been subtly redesigned to bring the appearance of the land of Hyrule up to modern video game standards. This new version also sports a subtly different look, being brighter and more colorful than the original. This change was likely implemented to make things easier to see on the 3DS's screen under varying light conditions. Though this is an understandable design choice I do miss the more realistic tone of the original. A huge graphical overhaul has brought the game closer to modern standards.Of course, the original control scheme designed for the N64's chunky controller had to be reformatted for the 3DS. Though the portable has significantly fewer buttons, the touchscreen provides the additional inputs. The ocarina, which was practically required to be kept equipped to one of your three item buttons, now has its own permanent button on the touchscreen. With the addition of two further touch-based item slots, this results in both less item management and interruption to the flow of the game. Ocarina 3D also makes use of the system's gyroscopic sensors for some motion-controlled first-person camera and weapon work. It's surprisingly responsive though any dramatic movements require an equivalent real-world motion, something not always feasible if you're playing on a cramped subway train or lying in bed. It's great for tasks that require only incremental movements such as the shooting gallery games but otherwise you'll probably keep it switched off. As with all titles for the system it makes use of the stereoscopic 3D feature. Perhaps it's the detailed environments or the lack of a drop in frame rate but this is by far the best implementation of it I've seen on the system so far. It's just a shame that the dimensional depth never rises above being a neat graphical effect to factor into the game play itself. Which leads me to my main concern about Ocarina 3D; Nintendo simply didn't take it far enough. Outside of the obligatory 3D effect and minimal use of motion control, it failed to take advantage of the 3DS's unique capabilities. The augmented reality, StreetPass and SpotPass functions (arguably the system's best features) aren't utilized here at all. While the fresh coat of paint has hidden most of the game's visual signs of age, its wrinkles still show through in certain areas.I also can't help but feel that Nintendo skimped on providing new content in the game. 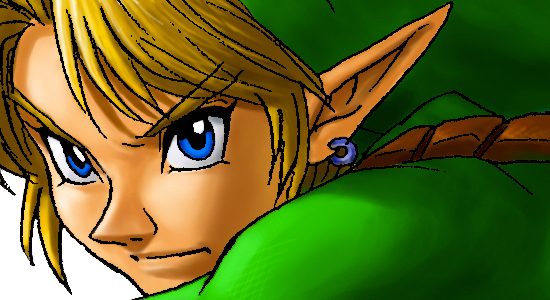 Past Zelda re-releases have seen substantial additions like new dungeons and modes to appeal to returning fans, and while Ocarina 3D features two modes that weren't in the original, neither could be classified as being new. Master Quest was a rare and super-hard version of Ocarina of Time released as a bonus disc for the Nintendo GameCube. It's nice that it comes on the cartridge this time around but, again, it isn't original content. Boss Rush mode is even more disappointing, comprising of recycled boss fights that have to be beaten under a time limit. But for speed-run fanatics, I don't see much widespread appeal to it. While the fresh coat of paint has hidden most of the game's visual signs of age, its wrinkles still show through in certain areas. Some gamers, especially those coming to Ocarina fresh, might find the combat a little simplistic given the refinements and additions made by later Zelda titles. The once technically impressive large expanses of Hyrule Field and Lake Hylia now seem like strange design choices, feeling dull and mostly empty. The blockiness of the world design also stands out more than ever before; I'm thinking mainly of the Lost Woods, which is essentially comprised of a series of small square rooms. Though it's technically a great revision of a classic, probably the new definitive version in fact, I'm bothered that Ocarina has received an overwhelming positive critical response. The majority of the gaming press are fawning all over it, pushing its score on review aggregate sites up almost to that of the 1998 original despite it being neither revolutionary nor cutting-edge, while neglecting the platform's features. It could even be argued that it straight-up doesn't suit the portable nature of the system, given its long-form cinematic design. Conversely, I have to agree with the reviews in that this is the best game for the 3DS. Ocarina 3D is packed with more content, better visuals and game play than anything else currently available for the system. That a thirteen-year-old game handily trumps anything else on the system speaks volumes about the state of the 3DS's current software library. I am definitely someone who never quite finished the game (mainly because I was borrowing an N64, as I've never actually owned one). I also don't like it on such a small screen. I both like and dislike using the accelerometers to view the environment in 360 degrees. I have a bit of trouble using the bumpers to target (it's uncomfortable, and that is why I never really wanted a portable anything). But all told, the nostalgia of the game outweighs anything negative because I am just having SO MUCH FUN! "The augmented reality, StreetPass and SpotPass functions (arguably the system's best features) aren't utilized here at all." I am curious as to what you would have in mind. StreetPass has its place, but I don't think it applies to everything. Why try to force awkward things into a complete, beautiful product? I agree, I would have loved to have seen this version on the big screen with an awesome sound system (and an orchestrated score). To justify this being a 3DS game, that's why. As it stands Ocarina 3D whiffs a little of Twilight Princess syndrome, crow-barring a game onto a platform is wasn't designed for in order to boost interest in said platform. I'm no game designer but Nintendo could have done anything they wanted with StreetPass etc, even if it was just meta-game features or a seperate smaller game that comes packed-in like the original Four Swords. I find myself both profoundly grateful that I possess the gamecube masterquest version, and compelled to play it again.